Newmarket, NH; October 12, 2016 - Our company succeeds because our community trusts us to provide its members with the best products and service. In turn, we trust and support many charitable and nonprofit organizations throughout New Hampshire and Maine. Through donations of time and money, working with diverse and impactful community organizations allows us to help others as our community helps us. Here are a few of the worthy events and groups we are proud to support, and details about how you can get involved with these great community organizations, too. Deerfield Fair - The Deerfield Fair is New Hampshire's oldest family fair, with 140 years of agricultural exhibits and activities. Proulx Oil & Propane exhibited throughout the weekend. Learn More. American Cancer Society Making Strides Against Breast Cancer - From our bright pink truck to our participation in the organization's charity walks in Exeter and Dover, we embrace every avenue we can to support this cause. A portion of the proceeds from deliveries made by the pink truck are donated to the ACS. Join us at an event, Making Strides of Exeter on Sunday, Oct. 23 or Making Strides of Dover on Sunday, Oct. 30, or find/support a walk in your town. Learn more about our Pink Truck Campaign. Veterans Count Eagle Parade and Gala Auction - Veterans Count is a program of Easter Seals that supports veterans and their families. Proulx Oil & Propane sponsored an eagle statue and held a naming contest for it to increase visibility of the organization. The eagle, proudly named Freedom, will be part of the Eagle Parade and Gala Auction on November 10. Dover Band Show - We proudly donate funds to help produce this evening of music that includes high school students from throughout the state. The event is Saturday, October 15. Child Voice International - This nonprofit organization builds therapeutic communities creating a village of refuge for children and youth traumatized by conflict - war orphans, former child soldiers, or members of displaced families. We're proud to extend their reach by making charitable donations and sharing this incredible group with you. Exeter Festival of Trees - The 17th Annual Festival of Trees Fundraiser and Silent Auction is December 1 and features more than 50 beautifully decorated trees available for bidding. Proceeds benefit the Exeter Chamber of Commerce's Children's Fund, which provides clothing and bedding to children in need. 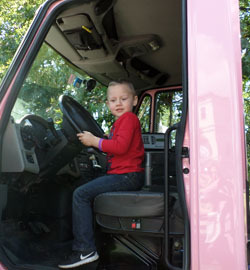 Touch a Truck - This popular event was a perfect opportunity for us to bring our Pink Truck out to mingle. Proceeds from the event benefited the Richie McFarland Children's Center, and we're honored to participate in and support this year after year. 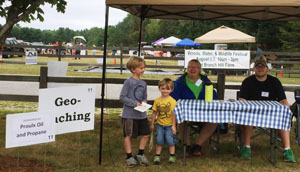 Woods, Water and Wildlife Festival - We had a great time sponsoring the geocaching activity at this annual event at Branch Hill farm in Milton Mills. Proceeds from the festival, which celebrate the natural world, support Moose Mountain's Regional Greenways' conservation and educational outreach work. Our tradition of giving back started when the company was founded in 1944 in Epping, and though we've grown to four locations and dozens of employees, our values remain the same.